The National Hay Association proudly congratulates John as the recipient of the Haymaker Award. The award honors members who show outstanding service, dedicated leadership, generous contribution, exceptional performance or inspiring commitments to the NHA and the hay industry. It is the highest honor that a NHA member can receive. John owns and operates JD Russell Hay and Straw. Neither John nor his wife Denise came from a farm family. But in 1985 they sowed the seeds of their dream, working together part-time with less than $1500 in equipment. 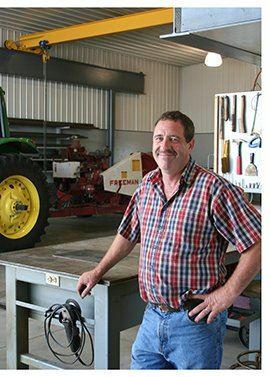 Expanding every year, and paying cash for equipment, the Russell's worked hard until they were able to devote themselves full-time to the business in 1992. Today with seven children and eight grandchildren so far, the Russell's work together in what John describes as their “family passion” – producing top quality hay and straw for horses. To John, reputation is more important than profit. Long-term relationships with customers and vendors are the highest priority. John joined the NHA some 25 years ago and has served on various committees. He currently co- chairs the BY LAWS Committee and also serves as a member of the Board of Directors. The Haymaker of the Year Award was created and sponsored by Kemin Industries in the early 1980′s Members were asked for nominations at the awards banquet annually. In the early 1990′s, the NHA Board of Directors created the Haymaker Award Committee to continue the tradition. The Haymaker Award honors members who show outstanding service, dedicated leadership, generous contributions, exceptional performance, or inspiring commitment to the NHA and the hay industy. The award is the highest honor that a NHA member can receive. 1993 – Lloyd Eldred, Jr.